I got a great price on a new Odyssey. The staff was very friendly and helpful. It was a fantastic experience from start to finish. Thanks! I bought a 2018 Honda civic hatchback sport from Arnold a couple weeks ago and it couldn't have gone smoother. He had sold me a car within 10 and it was the most hassle free sale ever. 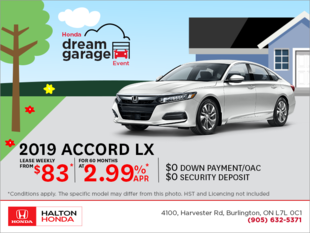 If you are ever looking at buying a Honda go to Halton Honda and see Arnold. He will take care of you like family! After nineteen years, I decided it was finally time to purchase a new car. Allan (sales) greeted me with a smile and patiently answered every question I asked about the Civic. Our first meeting was very productive, and I left armed with knowledge and pamphlets/brochures along with an invitation to drop by again if I wished. There was absolutely no pressure to purchase. It is now a month later, and I am reflecting on the professional, courteous experience I had when buying my first Honda. Allan and Dwayne (finance manager) ensured the entire process was pleasant and uncomplicated. I appreciated not having to wait upon arrival or being interrupted during any of our meetings. The negotiations were straightforward, and I even visited the Service Department to ascertain future maintenance prices. I’ve e-mailed or called Allan a couple of times for further information or clarification related to the car’s technology, and he always responds quickly with a complete explanation. As a customer, I feel valued and respected. I would highly recommend Allan and the Halton Honda team when purchasing your next vehicle. I had a great experience at Halton Honda. Dave was great. I feel confident that he worked hard to get me into my new Civic Hatchback for the best price. Everyone was friendly and made us feel welcome. No pressure at any time. I would definitely recommend Halton.